COB Calais should want to be playing basketball in the LF2 Final Four in the "Salle Calypso" after their victory over Cavigal Nice (72-56). However for this to happen COB Calais must win at least one more game than Cavigal Nice from the remaining five games. It was not a good evening for Cavigal Nice who are still playing basketball at the three-point line. They managed just 4-from-21 while turning the ball over 24 times. However their main problem was not getting to the free-throw line. They just made 13 trips and scored only 8 points. On the other hand Calais were almost perfect in free throwing with 21-from-23 balls hitting the target. Calais also picked up 19 points from turnovers compared to 14 for Nice. These small details proved to be the difference that gave Calais a 16-point victory. In the first game between the two clubs, Cavigal Nice won by 13 points. But this defeat in round 23 leaves them behind Calais on aggregate score if the teams finish tied at the end of the season. So with five games to go to the end of the regular season the battle for the regular season title has once again become interesting with Calais playing its best basketball. The match itself was not a classic with too many errors. Yet Calais were the better team: they shared the ball more and dished out 17 assists. Mélanie Arnaud (18 points and 14 rebounds) gave a demonstration in drawing fouls and then hitting free throws (10-from-10) for the hosts. 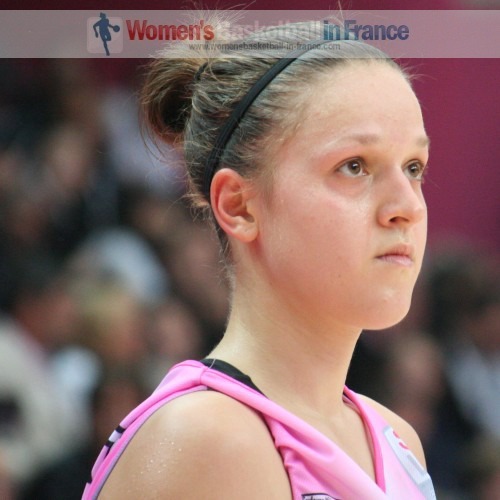 Manon Sinico (17 points) was the most economical shooter with 17 points coming from 7 shots. Kierra Mallard was the third player in double digits with 14 points. When Cavigal Nice gave up playing basketball from the three-point line they gave the ball to Jeanne Senghor-Sy who scored 21 points and collected 10 rebounds. Angers are at the moment the best team at playing basketball collectively in the division. Again all ten players got on the score sheet in their victory (65-43) against US Laveyron. 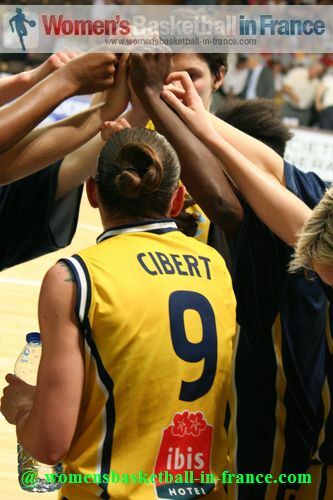 Camille Aubert (in picture) was the leading scorer with 12 points while Aurélie Favre (8 points) led the assists with 6. Sophie Le Marrec also scored 8 points while picking up 10 rebounds. US Laveyron's sixth straight loss also ended any chance of a top 4 finish. Limoges played perfect basketball for the first 17 minutes against Dunkerque Malo and led by 17 points (40-23). Then bad habits set in and with just under three minutes to play Dunkerque went in front for good. Dace Pierre-Joseph (20 points) with 11 consecutive points in the final quarter was the driving force as Dunkerque pulled off the win (67-64). In the Brittany derby that was broadcast live Léon Trégor fell at home to Roche Vendée (53-55). The match never really took off. Roche Vendée dominated the rebounds and did most of their scoring in the paint. Léon Tregor kept themselves in the game from the free-throw line and had the chance to force overtime at the buzzer. However Marie Butard missed both and the chance was gone. It has been a tough week for Reims as they were deducted 2 points for their victory against Limoges in round 7 because of a licence violation. They also lost on the road against Illkirch-Graffenstaden (56-68). As a cosequence Reims cannot qualify for the final 4.